A Frenchman who learned to box at the Woodlawn Boys Club, Loic Wacquant, AM’86, PhD’94, also spars in academic circles. Loic Wacquant’s doctorates—from Chicago and from l’École des hautes études en sciences sociales in Paris—are in sociology. But when Wacquant, AM’86, PhD’94, visited campus in early May, he came as the guest of the anthropology department, talking about a new form of ethnography as practiced in his long-awaited book, Body and Soul: Notebooks of an Apprentice Boxer (Oxford University Press, 2004). Never mind that anthropologists, worried about issues of subjectivity, are reevaluating the ethnographic enterprise. The 43-year-old Wacquant (pronounced Vah-KAHN) believes in the value of what he calls “carnal sociology” or “ethnography by conversion.” His ideal of experimental ethnography, of entering into the situation body and soul, is “not going native in a naive way,” he told an anthropology workshop, “but carrying in your backpack all the tools you have from your discipline.” There is, of course, a risk. As he found out, you might drop your backpack. After planning to write his dissertation on colonialism in New Caledonia, the French-controlled Pacific island where he’d fulfilled his military service, Wacquant found his interest shifting to the American ghetto. In August 1988 a friend mentioned a boxing gym a few blocks from Wacquant’s graduate-student housing on the edge of the Woodlawn neighborhood, and he saw a visit there as a way to gain some introductions. With that Wacquant, who’d played soccer and tennis as a youth but knew nothing about boxing, began to train. “What I had not anticipated was that I would get drawn into that world,” he says, so much so that soon “I was not coming to campus.” The academic arena seemed “dead,” despite the fact that he was a promising student with two influential mentors—the French social theorist Pierre Bourdieu and Harvard sociologist William Julius Wilson, then teaching at Chicago and his dissertation adviser. Life was in the gym. He spent hours there each day, month after month, eventually fighting (and narrowly losing) a 1990 Chicago Golden Gloves bout. Granted a three-year appointment to Harvard University’s Society of Fellows, he stayed on in Chicago until Harvard recalled him to Cambridge in 1991. The gym closed in 1992, and eventually the building was razed, his pugilistic paradise paved into a parking lot. All that was left was to turn the notes he’d never stopped taking into a book. At a 57th Street Books author event, Wacquant joked about the decade his friends from the gym had to wait for autographed copies of Body and Soul (first published in 2001 as Corps & âme, Carnets ethnographiques d’un apprenti boxeur). Armour, to whom the book is dedicated, never got his copy; he died in February 2000, and the 57th Street appearance was Wacquant’s memorial to his coach. The book was hard going. 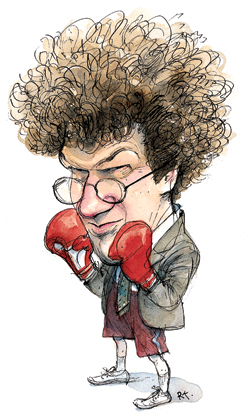 Leaving the gym around which he had come to shape his daily life created “a deep abyss of depression.” Advance reports meant that “I’d become sort of a circus animal,” pointed out at conferences as “the boxing sociologist”—a celebrity that seemed to raise false expectations for the work. And, he admits, “I didn’t know what form to give it,” an indecision that reflected his dissatisfaction with the ethnographic genre. After his Harvard fellowship ended in 1993 he joined the sociology faculty at the University of California, Berkeley. Over the next decade—dividing time between Berkeley, a research appointment at the Centre de sociologie européenne du Collège de France, and visiting professorships in the United States and abroad—he earned a 1997 MacArthur “genius” fellowship, cofounded the journal Ethnography (2000), and published some 100 articles on sociology, anthropology, criminology, social theory, social policy, philosophy, and urban and cultural studies. He also found a way to write Body and Soul. If Wacquant is somewhat happy with Body and Soul, he is less sanguine about the state of urban sociology. He said so with typical bluntness in a May 2002 American Journal of Sociology review of three major urban-poverty studies—Code of the Street: Decency, Violence, and the Moral Life of the Inner City, by Elijah Anderson, AM’72, who teaches at Penn; Sidewalk, by Mitchell D. Duneier, AM’85, PhD’92, now at Princeton, and No Shame in My Game: The Working Poor in the Inner City, by Harvard’s Katherine Newman. This spring Wacquant moved to the New School University as distinguished university professor in sociology, prompted by “getting closer to Europe, trying out New York City life, and better research support.” Though there’s “no time to go to the gym,” he’s found a bit of the Woodlawn Boys Club in his Tribeca apartment building: “There’s a hard bag, and I go beat it every day.”—M.R.Y.